This is the 51st. 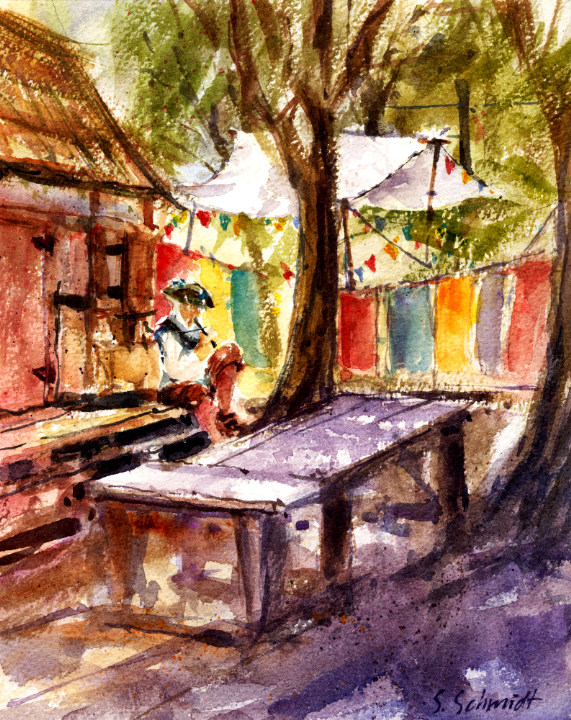 year for the Renaissance Pleasure Faire! It's been held every year since 1962 at a few different Southern California locations. It's now held at the Santa Fe Dam which offers lake and mountain views. The fair is a re-enactment of a marketplace in Elizabethan England (1580's). Over a thousand actors and performers dress as authentically as possible for the period. Visitors to the fair are encouraged to dress appropriately too, but that's optional. One of the plein air groups I go out with has some members with fair connections so we were allowed into the area to paint on a day the fair was closed. The colorful booths and stages were there, and we had four costumed musicians posing and playing for us. The weather was beautiful and the setting was really exciting to see. I painted a watercolor, 8x10" and small gouache, 5x7". There was a gorgeous Sun/Moon stage that I loved. Maybe it will be there next year and I can think of how to simplify it for a painting. 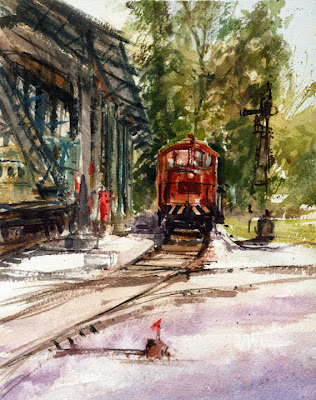 Paintings can be donated for a May auction to benefit a scholarship fund. I'll be donating my two paintings. I hadn't been to the fair before so I really enjoyed the day in such colorful surroundings. I just realized I didn't post my entries for The Virtual Paintout for March. It's the end of April so I'm a little behind! 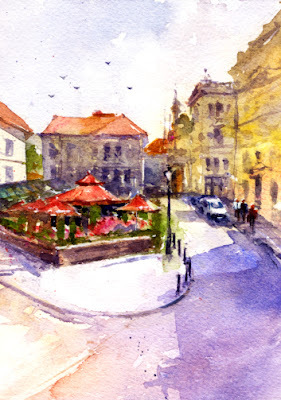 To participate, artists must use Google Street View to find their view to paint. The Virtual Paintout is run by artist Bill Guffey. He selects the month's location and posts all of the entries on his blog and on Facebook. It's really a lot of fun and I look forward to browsing places I'll never see otherwise and also trying a watercolor. It's also neat to see the locations other artists have found and their paintings. The location for March 2013 was in Lithuania. I tried a watercolor and also a gouache, both small pieces, 5x7". It seems I'm always running short of time at the end of the month when I need to complete some paintings. It's time this month to get my paintings for April done! It was a busy Saturday! 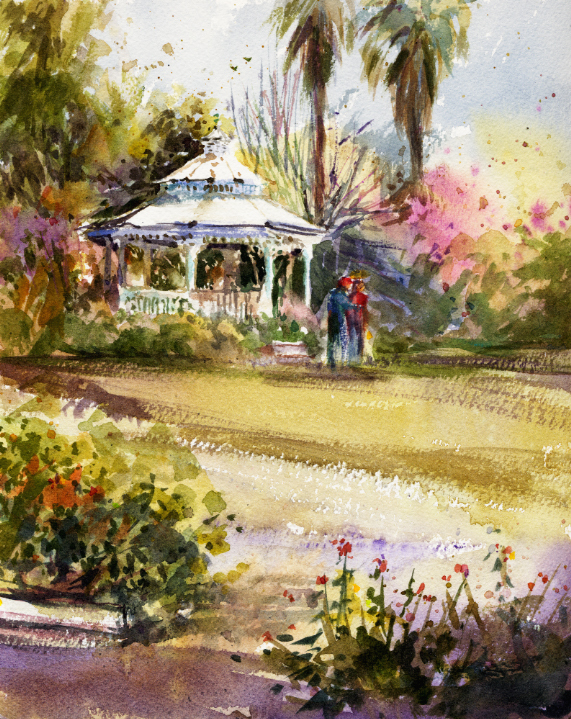 I didn't want to miss the Saturday paint-out group's morning at Arlington Garden in Pasadena. Some varieties of the spring flowers there are fading already. Also taking place on Saturday was the ninth annual "Saturday in the Park with the Masters" event. The Mid-Valley Arts League puts on this lovely event with a dozen invited oil and watercolor master painters. It takes place in a gorgeous setting in Pasadena. 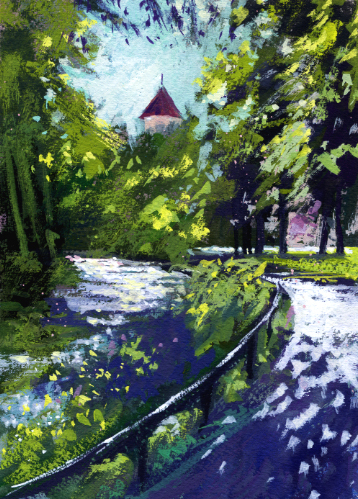 Anyone can paint there if they want to, or they can walk around and watch some favorite artists paint in plein air. I decided to do a small (5x7") gouache at Arlington Garden to try to capture the feeling of the red and orange poppies blooming. Then I'd go to the Masters event which was close-by. The umbrella in the view I chose at the garden was actually white with blue stripes, but I had to change it to red. I thought of adding a figure in the distance but the piece is small with enough going on. Next time I'll plan better. I've painted there a few times before, noted in this post Saturday Paint-Out. The Masters event was a lot of fun. The grounds are beautiful with grand old structures, streams, waterfalls, and koi ponds. Nothing better than being able to watch artists I admire do a painting to see their choices first-hand. Looking forward to next year! Pete Morris in the foreground. Brenda Swenson and Chuck Kovacic painting one of the models. Tom Fong at a koi pond. Frank Eber and Jose De Juan. 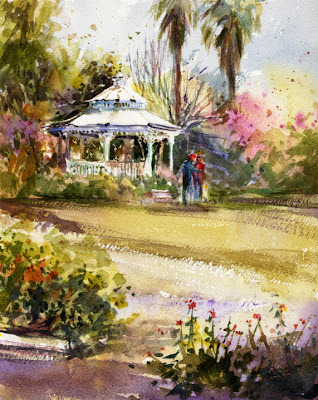 Spring is a wonderful time for a plein air paint-out at the Arboretum. It was my third opportunity to paint there. 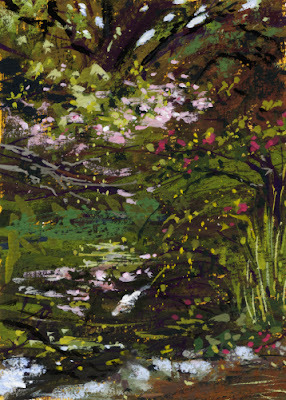 I posted my first two paintings in "The Arboretum" and "Baldwin Lake". On those two visits I walked south to the Queen Anne Cottage and Baldwin Lake. 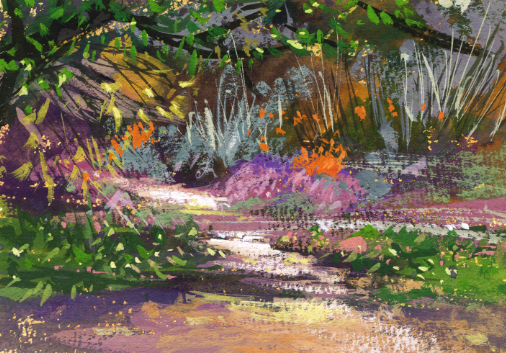 I decided to check out the other direction for a possible view to paint. It's been quite a few years since I walked around there much and certainly not with a searching eye for a watercolor subject. 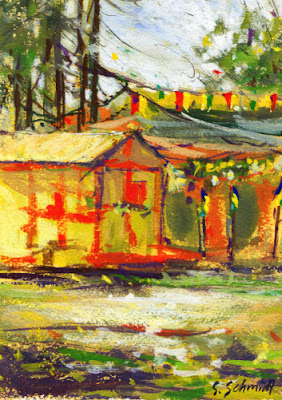 It turned out I happened across subjects to paint on future visits as well as one for the day...the gazebo. 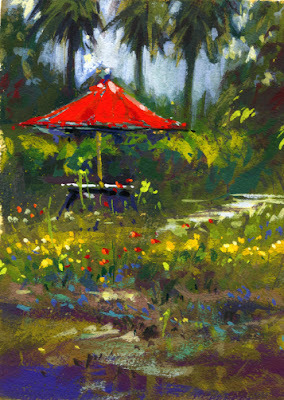 My choice of the gazebo depended on some shade to paint from and I also wanted to try a small gouache (5x7") of the African Garden while my larger transparent watercolor (8x10") stages dried...both below. On my recent previous visits to the Arboretum, I didn't see many of the famous peafowl that live there. Canada geese were everywhere but not many peafowl sightings. On this visit, since it was spring I guess, there they were. The males, the peacocks, have an extremely loud call, which was everywhere and non-stop. Our casual discussion of the group's paintings was a little hard to hear at times. I didn't see any peahens until I was leaving and looked up at the gift shop roof and there the girls were, staying out of the peacock's way. I really had fun with both paintings and the wildlife there is always entertaining. Our paint-out location was at Travel Town, a really neat railroad museum. It's in a corner of Griffith Park in Los Angeles. I painted in Griffith Park with the group a year ago at the Griffith Observatory. My painting is here in my post "Space!". Travel Town was dedicated in 1952. With its 17 full-scale, steam locomotives, and lots of other railroad cars and rolling stock, it's a "must" for kids and enthusiasts. It's also a terrific place for plein air painters. The last time I remember being at Travel Town was for a perspective class, many years ago. I can still remember my nerves at trying to accurately draw these huge engines in perspective. At this scale, I'm much more comfortable with indicating the scene rather than duplicating it. A really gorgeous "train house" has been added since I was there years ago. I wanted to include at least some of it in my watercolor. This engine I painted is a diesel switcher, designed for switching freight cars from track to track around railroad yards. There are so many things to see at Travel Town as well as future painting opportunities. 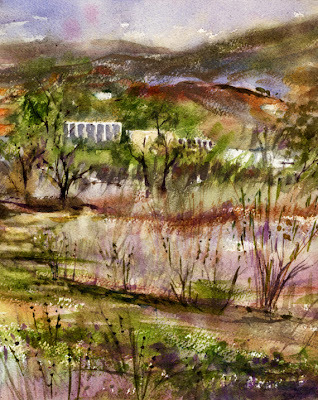 Our recent plein air painting location was at Hahamongna Watershed Park in Pasadena. This used to be Oak Grove Park and I hadn't been there before. It's a wonderful spot at the base of Arroyo Seco Canyon. One area has lots of oak trees, and there are great mountain views to paint. As its name suggests, it's also a flood basin behind Devil's Gate Dam. The morning was hazy which to my mind is gorgeous for photos and hopefully to try to capture in a painting. We headed out from the oak shaded parking lot into the dry river basin. There are many interconnected hiking trails through the various basin plants. Considering finding some shade, one small grove of a few eucalyptus trees seemed to be a good location to stop. I couldn't decide whether to paint the view north of JPL, Jet Propulsion Laboratory, or the view south of a trail into the trees. I wished I had my opaque gouache with me for the cloudy look of the bands of dried plants going to seed and the hazy mountains. 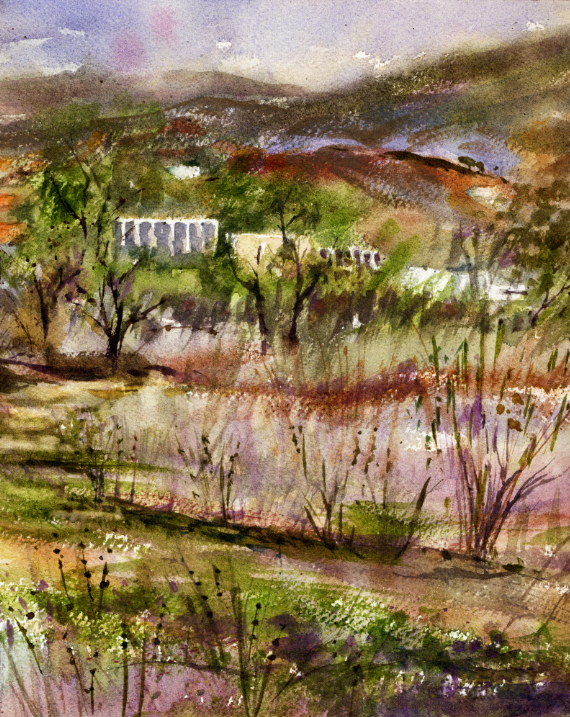 I had to give it a try with my transparent watercolors and chose the JPL view since I like to include a building or structure. Dog walkers came by and even a woman on horseback. The bottom photo is of the view I didn't paint. Next time! The garden was more beautiful than ever on Friday. In the Japanese Garden and tea house area, the red Japanese maples stood out against the cherry trees blooming in white. My photos don't capture seeing it in person of course. I walked to the Rose Garden which wasn't in bloom yet but there was a class watching their teacher paint a demo piece. All this reminded me of a special visit last October with my sister by marriage, Sara. I chose the view I wanted to paint but when I went to set up my watercolors, they weren't in my bag! At least I did have my gouache with me. So, I changed my mind on the view and "bravely" decided to try painting by the stream which was beautiful with light-colored, flowering trees reflecting in the dark water. This would be too hard for me to try in transparent watercolor but I might have better luck with gouache since it's opaque. My gouache pieces are small, 5x7", which is a good thing. The group sets a time to meet to talk about our work and I spent a lot of my time looking around. A white koi kept swimming by which I decided to include. Hope you can find her! It's fun to take the local light rail for a plein air paint-out at Union Station in downtown Los Angeles. It's a beautiful landmark building, opened in 1939. There is a stunning main waiting room with tall windows reflecting light on the tile and marble floors. I'm adding an interior photo below. The 1930's style chairs are a main attraction. I painted the building last July and posted about that experience in Union Station. 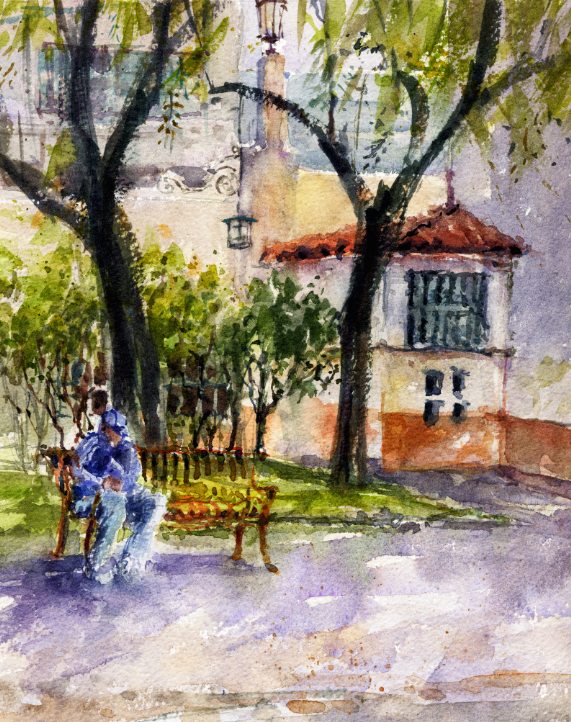 That time I painted from Plaza Park across the street. On this Saturday we painted views around the building. There are enclosed garden courtyards or patios on both sides of the main waiting room. I chose a view to paint in the north side patio which was shady, uncrowded, and has a lovely tiled fountain. Such an exciting location and fun morning.